So, you don't know much about deliantra and or programming, but you want to make maps? This Tutorial will explain how to install the Deliantra server (from CVS) on your linux system and making your first maps. If you are stuck somewhere, please contact us (the developers). Note: I am assuming here that you are using a bash-like shell. And that you are logged in as root. If you want to install and setup everything from a regular user account you have to take care of all permission handling yourself. Now download the editor! You can either install all the Perl modules and stuff by yourself or just choose the binary: editor download page. I'm not going to discuss the installation procedure for the CVS here, as it requires much knowledge about your system and how to install (perl) software from source. If you only want to make maps, the binary will do very fine (on x86 systems). So, the next thing is to download the editor. Note: If you run into problems when starting the editor make sure you have gtk2, glib2 and pango and cairo libraries correctly installed. As i don't know your linux system you would have to figure out that yourself. Note 2: If you are familiar with your system i recommend to set the CROSSFIRE_LIBDIR variable in your shells startup configuration. 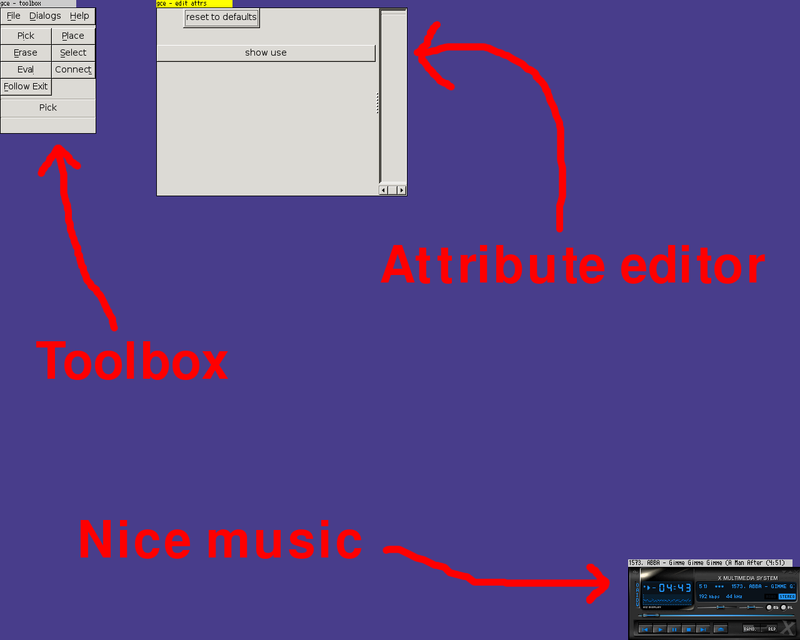 Now i could let you run around for yourself, if you are planning to figure out stuff yourself now, do it, but make sure you find the manual of the editor in the toolbox window in the HELP menu! 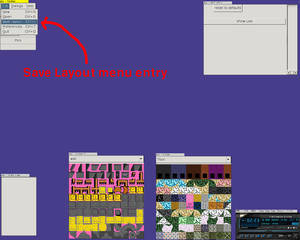 Now it's time to click the Save Layout entry in the File menu. 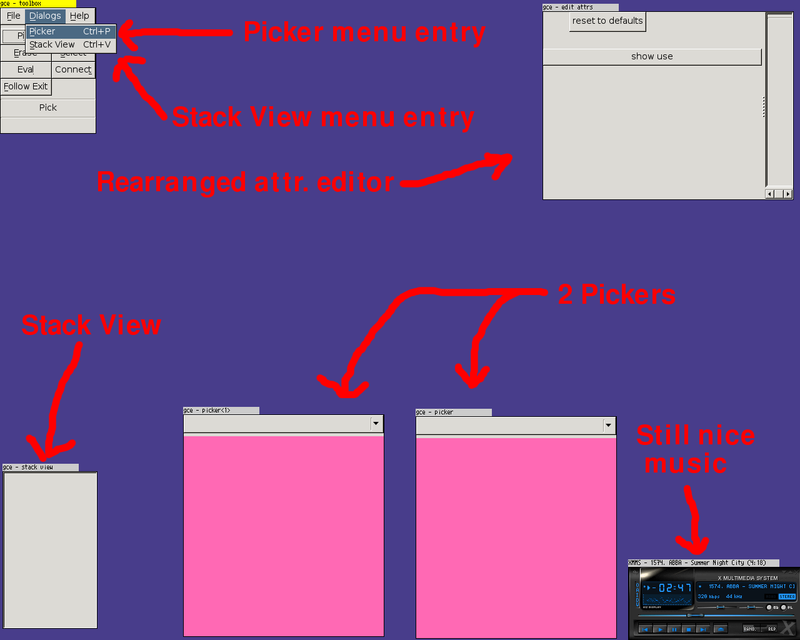 It will save all the window sizes and positions. So you don't have to make all the layout work next time again. As you go on with map editing you maybe find other layouts more useful, try around, and of course: use more pickers. 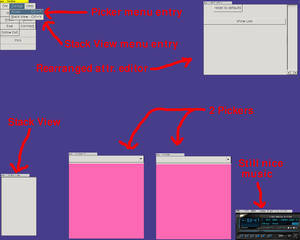 I mostly have 3-4 pickers open to do all the stuff i want. This step will introduce some tools and shortcuts you may use on a regular basis when making maps. First make a new map. Go to the File->New menu for that an click on it. 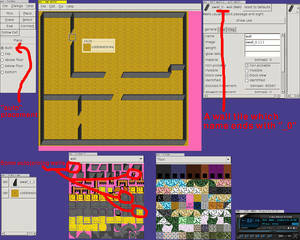 Next a dialog will open up, that will ask you for a map size. The default is 20x20. You can adjust that like you want. But we recommend not to make maps much larger than 50x50 or 60x60. It reduces the server load somewhat. 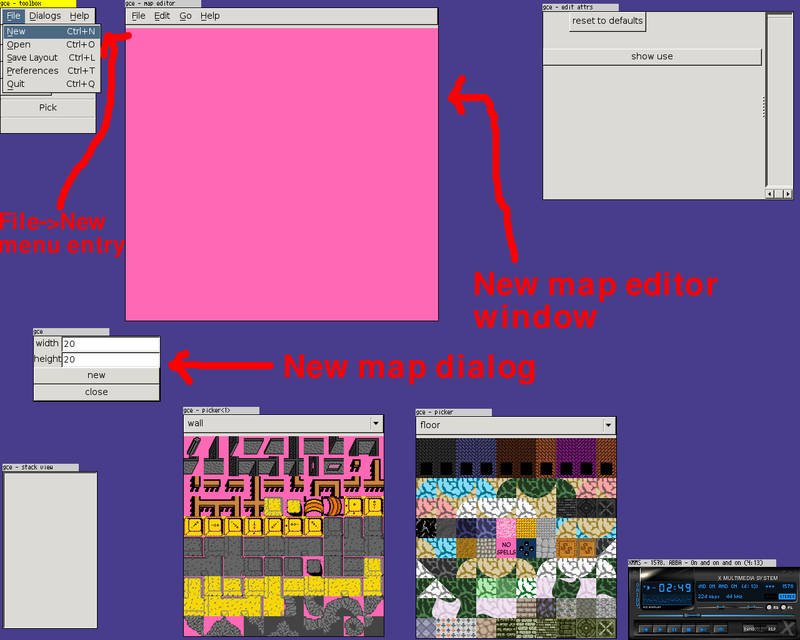 Better use tiled maps or linked maps (with exits between them). You recognize the ugly color on the backgrounds of the pickers and the map editor window. It's not configurable, and it's there to give a clear contrast to stuff on the map. Note: You can scroll in the map editor window and the pickers by holding down the middle mouse button and drag it. (This is similar to GIMP). 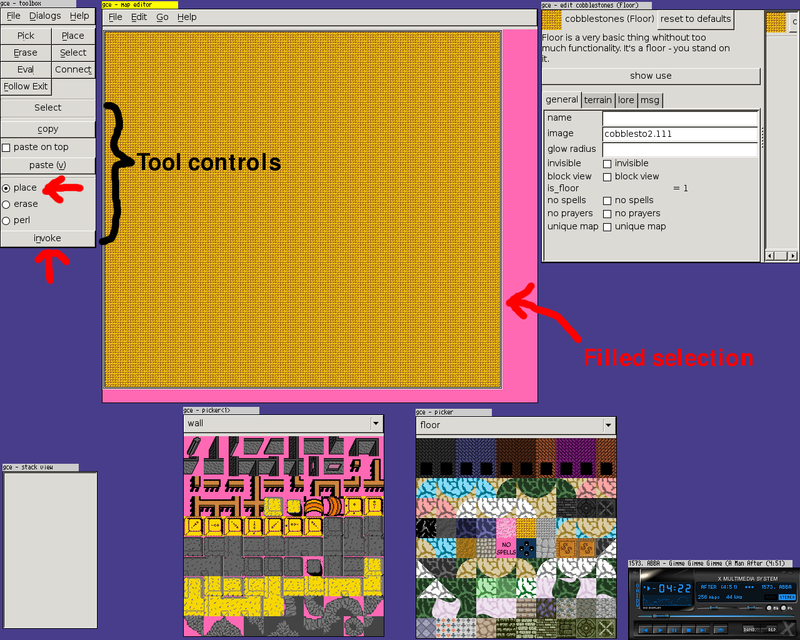 Now resize the map editor window a little bit and select the Select tool from the left and draw a rectangle over the map with it. Next select a floor from the picker. The floor will appear in the attribute editor. Now look in the toolbox window on the bottom, where the tool-controls are. There are radio buttons: place, erase and perl. Place executes the place tool on every cell in the selection and erase executes the erase tool on every cell in the selection. The perl thing is something advanced, it runs a small perl script on every cell in the selection, it's likely to go away some day (maybe). Next we are using the autojoining placement of walls, pick the "awall_0" tile from the picker with the walls. Make sure the place tool is in auto mode. Note: In future when you want to use the autojoining placement you have to take care that the wall tile you are using to draw ends in "_0". But some walls, like the cave walls, are just not autojoinable. You will have to place them yourself. When you picked the wall, just draw some walls like you would draw in a graphics program (like GIMP). Draw something similiar like you see in the screenshot. With some holes in the walls. If you make a mistake while drawing the wall just hold the CTRL key to temporarily switch to the erase mode and erase all the bad walls and redraw the area. Or just Edit->Undo it. (Shortcut key combination for undo is CTRL+z and redo is CTRL+y). I assume here you have cvs installed. (the debian shortcut would be: apt-get install cvs). NOTE: the 'root@localhost: ~#' stands for your shellprompt, where '~' is the current working directory. And the ~ stands for your root homedirectory, if you are working as user 'root' your homedirectory should be something like /root. The prefix argument tells the configure script to choose /opt/deliantra/ as installation destination. This is done to prevent the server installation from polluting your system and to keep all files together. That should build the sources and install them. If you encounter problems here you could try to contact us. If everythin went fine, there should be a /opt/deliantra/ directory now with files in it. You should see lots of output running accross your screen. Congratulations, you just setup a Deliantra server. You maybe want to dive into the server tree and look around in the doc/ directory to find more about the server.